Are you one of the millions of sinus and allergy sufferers? Is your nose stuffed up? Do you experience sinus headaches, allergy symptoms, infections, or post nasal drip? Does your treatment improve your body’s disease fighting function, or are you simply treating the symptoms? 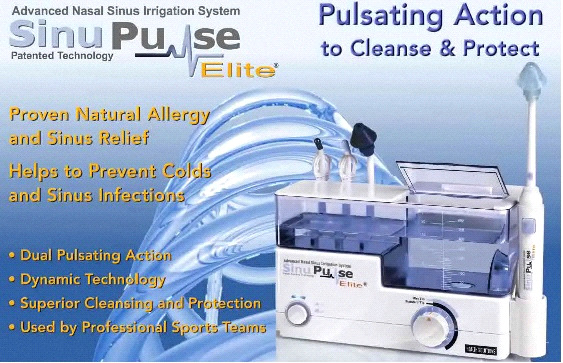 The SinuPulse Elite® Advanced Sinus Irrigation System effectively cleanses and clears your sinuses gently and pleasantly, a powerful tool for the maintenance of clear & healthy sinuses – Without Drugs.Developed and engineered in Switzerland it is the most advanced sinus irrigation system available and delivers superior performance, value, and durability. Featuring state of the art technology and extended two year warranty, the SinuPulse Elite® is the first and only pulsating irrigation system that has a patented dual spray and rinse operation. Never before has an irrigation system been able to deliver both a pulsating moisturizing mist spray or a more thorough cleansing pulsating rinse. If you have any questions regarding this item please give us a call (800)355-2956. SinuPulse Elite® 2 UNITS in 1!The SinuPulse Elite® was developed and engineered in Switzerland to be the best and most advanced nasal sinus irrigation system in the world complete with state-of-the-art electronics and Intellipulse™ technology. 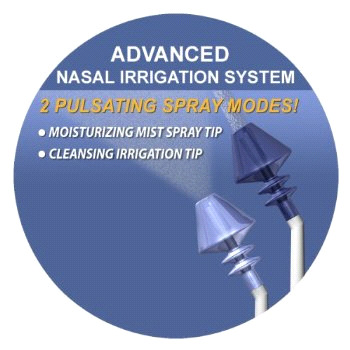 Featuring a patented SinuMist® function it is the only sinus irrigator capable of delivering both a gentle pulsating mist spray for soothing moisturizing relief and a more thorough cleansing pulsating rinse to clear the sinuses and massage the nasal cilia to their normal, healthy state. It really is like having two units in one! The oscillating stream of saline gently breaks down bio-film and frees your cilia to help you clear your sinuses of infections and foreign substances that can lead to chronic infections and allergy symptoms. Imagine rain drops falling from the sky landing on the soil with a gentle force that breaks apart soil particles. As this process continues, runoff water travels over the ground, collecting more soil particles dislodged by the rain and transports them to a new location. Pulsatile irrigation mimics a cleansing process present in nature. The SinuPulse Elite® treatment is gentle, pleasant, & soothing leaving you feeling clear and fresh. The sinus system uses only ordinary saline, or for best results, our enhanced SinuAir® nasal moisturizing solution. The SinuPulse Elite® is completely DRUG-FREE. Neti pots - after 3000 years there must be a better more effective method for nasal irrigation, right? Yes, neti pots can be messy, uncomfortable, and are somewhat primitive. They rinse the nose with a steady stream of saline which flows over the top of the thick, sticky, infectious, bio-film that is a breeding ground for bacteria and is resistant to treatment. The SinuPulse Elite® delivers a gentle yet penetrating pulsating saline rinse that maximizes the cleansing benefit and gently erodes and removes the bio film that is preventing the cilia in your nose from helping you fight your sinusitis infections and allergy symptoms. The SinuPulse Elite® takes only a minute to use and is recommended by leading ENT's and allergists for proven and effective allergy and sinus relief. Clinically Proven to Stimulate and Restore Nasal Cilia Pulsating sinus irrigation has been shown in clinical tests and published medical reports to improve and stimulate the nasal and sinus cilia - the body's first line of defense against foreign bodies entering the sinuses. A short period of regular use can help to restore their natural, protective, “sweeping” action, which is so important for long-term protective sinus health. Pulsatile irrigation is effective at breaking down biofilm to aid in the delivery of medicated rinses and nasal sprays which would otherwise sit on top of the biofilm limiting their effectiveness. Published medical reports demonstrate nasal irrigation can help prevent and reduce the severity of the common cold and flu virus. Pulsatile irrigation reported more effective at removing bacteria. Clinical studies report pulsating lavage is up to 100X more effective at removing bacteria. The SinuPulse Elite® features a state-of-the-art dual spray mode operation capable of delivering both a moisturizing pulsating atomized mist spray or a more thorough cleansing pulsating rinse. The gentle pulsating cleansing action of the SinuPulse Elite® Sinus System may even be eligible for reimbursement by insurance providers. The SinuPulse Elite® has been designed to be clog free and leak resistant. Its unique design is resistant to the corrosion and premature wear associated with the use of saline products in standard irrigator devices (i.e. Water Pik type appliances) not specifically designed for nasal irrigation. Sore Throat Relief and Fresh Breath Control Too! 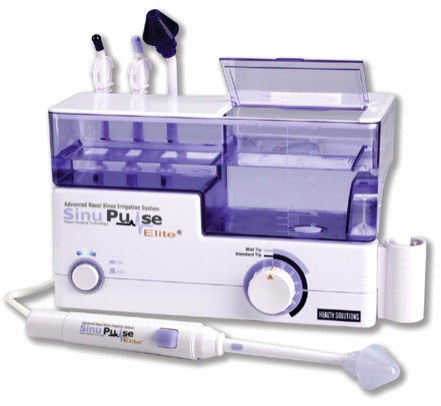 The SinuPulse Elite® Advanced Sinus Irrigation System includes the Throat Irrigator Tip & Advanced Tongue Cleaner. Throat irrigation provides gentle soothing relief of sore throat pain, reduces swelling, and encourages healing by massaging and stimulating blood flow to the infected area. The SinuPulse is a terrific device to maintain fresh breath control. Mucous buildup may contain foul sulfur producing anaerobic bacteria which are considered to be responsible for bad breath. The gentle pulsating rinse action helps clear mucous build up in the throat, remove bacteria, and rinse away food particles for fresh breath control. If you suffer with tonsil stones or cryptic tonsils, the SinuPulse can help keep the tonsils clear and clean. New state-of-the-art tongue cleaner utilizes a patented contour design and quad action for greater comfort and control.